Want to get the best deal when selling your car without having to battle with the usual hassle involved with the process of selling? If the answer is ‘Yes’, then it’s time to get yourself along to WeWantAnyCar.com Waterlooville and get cash for your car today! Why choose We Want Any Car Waterlooville to sell your car? Our little town may have been named in celebration of the Battle of Waterloo but you certainly won’t have a fight on your hands when you deal with us. We’re a friendly, helpful team. Our aim is to offer outstanding value for money for your car and ensure that everything is as stress-free and straightforward as possible. Our expert team will fully inspect your used car and give you a free valuation – with no obligation. 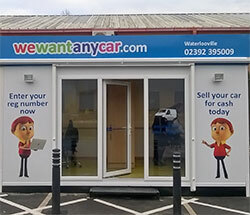 If you’re in and around the Waterlooville area and you’re looking for the easiest way to sell your car, get in touch. Give us a call on 02392 395 009. Or pop in. Just head for the Sainsbury’s Car Park, Hambledon Road PO7 7UL (it’s across the way from Halfords and Marks & Spencer). Or, if you prefer, you can complete a free ‘car valuation’ form online. Simply fill in all the details of your car for an instant quote. If you’re happy with our valuation, it’s just a case of arranging your one-to-one appointment. Then our team will take you through the necessary paperwork and purchase your car. No fuss, no hassle. That’s all there is to it. No complaints : it is just the way the motor trade does business !! Alex was very friendly and never put any pressure on me to sell. He explained how the sale would work. After the sale had taken place I came home and realised I had left a CD in the car, I contacted Alex and he took my CD out and held it for me until I could go and collect it. The man was personable, quick and efficient. Very pleased with the transaction and would recommend We Want Any Car. Thank you. There was a bit of a mix up about my appointment booked via head office , but when I turned up unexpectedly at my local branch the buyer, Alex, was free and we were able to arrange the sale of my car without delay. I had obtained a provisional valuation via the Wizzle website where I had detailed my car's imperfections, and the price offered was in line with this and, I thought, fair. Alex explained the sale procedure very clearly and the sale was agreed. As he had enough time before his next appointment he kindly drove me to a nearby railway station to catch a train home. The payment arrived in my bank account on the stated day. Altogether an excellent service. Nice and easy transaction and I was happy with the price quoted which I thought was very fair. Worked for me. Qucik and easy. Yes I got offered slightly less but understood why, all fully explained no high pressure buying/selling. Very helpful staff. Very good overall experience. I have sold two cars through We want any car .com and have reviewed fantastic honest appraisals. I have always received my expected quote or better. I have also attempted to use the other guys . ( We buy any ) without success. I'm one case they insisted my car had been written off after measuring the paint thickness. I had owned the car from new without an accident of any kind. We want any car is the best by far.. 5 star's.